We specialize in manufacturing cast aluminum outdoor furniture. Cast aluminum is one of the best materials available to make outdoor furniture. This material provides both strength and intricate detailing options, allowing the product to be designed with a look similar to carved wood furniture. Cast aluminum is corrosion resistant thereby capable of withstanding the outdoor elements. A product made with cast aluminum is in most cases solid or not hollow giving the product high durability and a higher product weight than furniture made with most other materials. 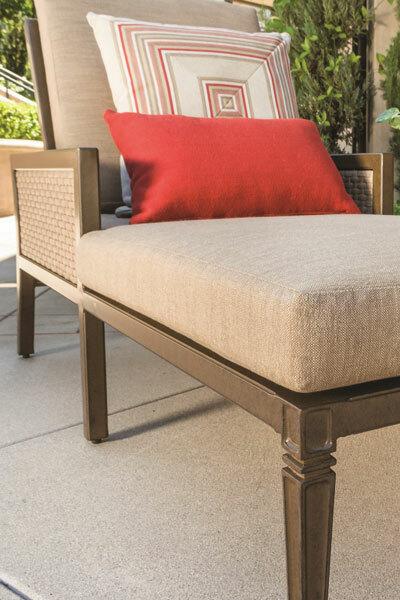 This higher weight ratio gives cast aluminum furniture the advantage to withstand windy conditions and not blow over. Using the right cast aluminum alloy is critical to achieving long-term quality. At Gensun we use AA 356 which is the best available and widely used by avionics and automotive industry manufacturers. Our cast aluminum products start with hand carved molds where attention to detail is second to none. The sand mold is used only one time to further enhance the quality and detail of the product. All of our table tops, even the 48”X 112” table top, are one-piece molds. This one-piece mold process captures design and durability to the fullest extent. Gensun includes all of these steps in every cast aluminum product we manufacture. Extruded aluminum is corrosion resistant and a good choice for outdoor furniture. Unlike cast aluminum it does not offer the intricate detailing or shaping opportunities. It is lighter weight and can be strong. The strength is dependent upon the quality of the material, thickness, inclusion of interior ribs for extruded and type of aluminum alloy used. Gensun uses these materials in some collections and in areas where beautiful detailing is not critical to the design. When used we make sure the product meets or exceeds industry standards for quality and durability in both the residential and commercial markets. 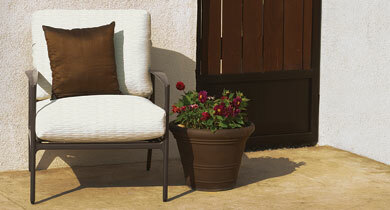 There are many types of fabric available for use on outdoor furniture. Gensun cushions, slings, padded slings, pillows and umbrellas are manufactured using fabrics that meet or exceed industry standards for outdoor use. The fabrics are anti-microbial, fade resistant, solution dyed and most are bleach cleanable. In addition to the full line of Sunbrella stock fabrics we also offer Sunbrella RAIN fabrics. These fabrics are water proof. Special cushion and padded sling manufacturing techniques are required using RAIN fabrics so that the finished product performs to the required standards. The result is a product that can be used almost immediately after getting wet. Gensun offers many RAIN fabrics to choose from and over 1000 fabrics in total. We want you to be able to decorate your outdoor room exactly as your heart desires. Like fabric there are many types of outdoor woven materials available. Gensun makes sure the woven material is the best available, UV resistant, weather resistant, durable, comfortable, colorfast and easy to clean. The woven material we use is a thicker design for greater strength and slightly textured to greatly reduce sliding when sitting in the chair. This texturing also gives the product a more natural look. The material will withstand the variations in temperature throughout North America. It will get somewhat stiffer when cold or softer when hot but the elasticity will return to normal with normal temperatures. We have 8 woven colors to choose from. All Gensun products go through an 8-step cleaning process and electrostatically applied powder-coat paint system to give you an incredibly durable finish that is scratch resistant, corrosion resistant, capable of withstanding temperature and precipitation variations and easy to clean. Many of our paint finishes also feature a special paint application on top of the powder coat that gives the product an antiqued or stone look. This application is baked on similar to powder coat and is extremely durable. There are 23 paint finish colors and three Paradise (stone look) paint finish colors available for our products. The Artisan Tops from Gensun are a HPL (High Pressure Laminate) solid core material that is extremely durable. They can be used indoor and outdoor in both hospitality and residential applications. They have a high resistance to scratching, abrasion, impacts, UV rays, bad weather conditions and heat. 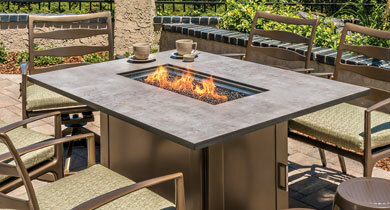 The Artisan Tops are used with the Phoenix Tables and available as gas fire pit tops. They are available in 2 unique finish options, Anthracite and Concrete Light.